1. 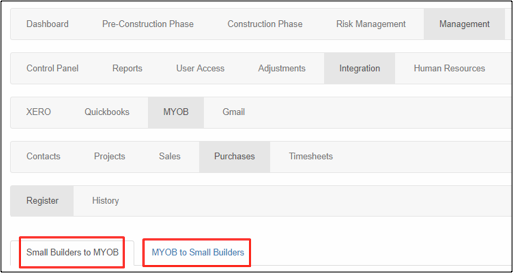 From the navigation bar, go to Management > Integration > MYOB > Purchases > Register > Small Builders to MYOB if you want to move your expense submissions to the history tab. On the other hand, go to MYOB to Small Builders if you want to move your MYOB purchases submissions to the history tab. 2. Select Show All from the options then click View Record. 3. Tick the checkbox of the submission you want to move to history tab. 4. Tick the option for Move the selected entries into Small Builders history. 5. Your entries will be displayed on the MYOB Purchases – History page.